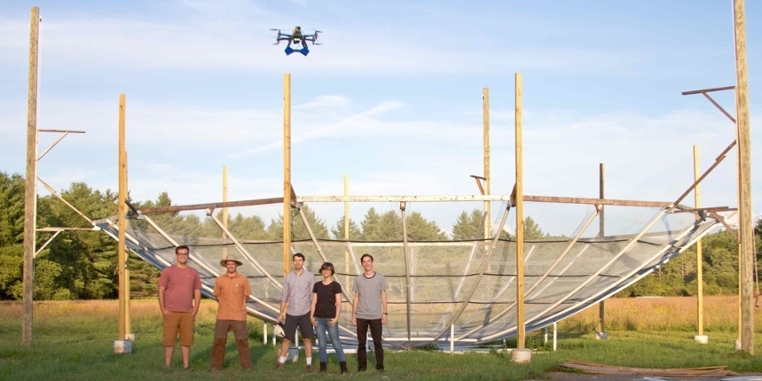 PHOTO (above): ASU and MIT team members pose for a photo during prototype tests of the ECHO drone for measuring HERA antenna patterns. The ASU team is heavily involved with the commissioning of HERA, data analysis, and developing simulation software. In particular, we are interested in how details of the instrument design and its operational performance can influence the final cosmological measurement. We investigate these issues through close examination of data from its raw state all the way through the analysis pipeline, and by simulating realistic instrumental responses. What we learn from data and simulation is fed back into the design and construction of the telescope, ensuring we build the best instrument possible to achieve our scientific goals. CHAMP students will be immersed in our Low-frequency Cosmology (LoCo) Lab of several postdocs and graduate students, along with undergraduate researchers. As new HERA dishes are constructed, there will be plenty of engaging projects. Examples include assisting with HERA observing, executing large instrumental simulations on supercomputers, and exploring the sensitivity of our array to other cosmological phenomena. Participants will engage in frequent discussions and meetings to collaborate on research problems. 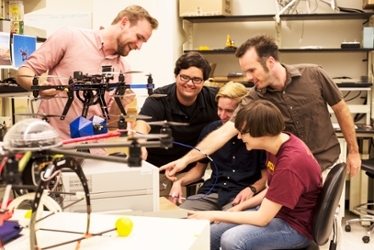 Dr. Danny Jacobs works with a group of ASU undergraduates to prepare drones for measuring the HERA antenna patterns. Students will begin the summer attending a one week radio astronomy “boot camp” designed to give them some of the skills they will need to succeed in their research. They will then work for the next 9 weeks with faculty and staff at ASU on HERA-related projects. Selected students will receive a $5000 stipend for the full 10 weeks. In addition, participants will be provided with housing and will be reimbursed for travel from home or campus to Tempe, Arizona. A recent group photo of the LoCo Lab team at ASU.